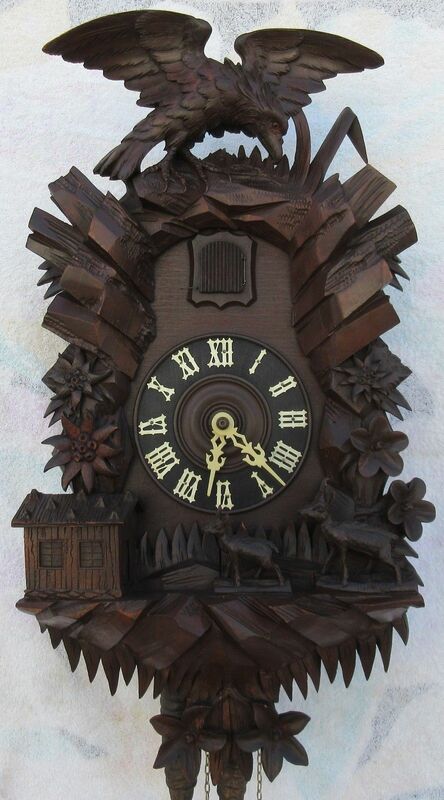 This German cuckoo clock is 23 inches high, 12 inches wide, and 9 inches deep. The clock is in excellent condition both on the inside and outside. The bellow pipes as well as the tops are thought to be the originals. This is one of the best German cuckoo clocks you’ll see! Even the cuckoo bird of this clock is painted well and still works flawlessly. This particular clock for sale has all original paint. 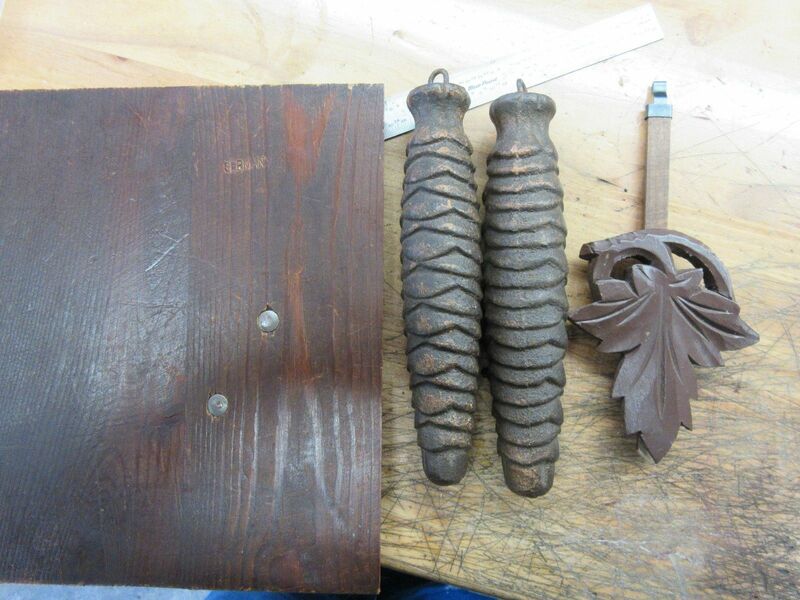 There is only one repair that has occurred at the bottom on the left flower, however, the rest of the carvings are original and in mint condition. The paint is original like stated before but the paint is in great condition, no fading. The pendulum may not be original; however, this is uncertain. The chains are original and they are proper fit to the clock. Along with the chains being original the weights are original as well. The movement is stamped Hubert Herr. The date of this cuckoo clock for sale would be around war, 1940-1945. If you are looking to buy a cuckoo clock with no need for a cuckoo clock repair guide, this one may be the best. 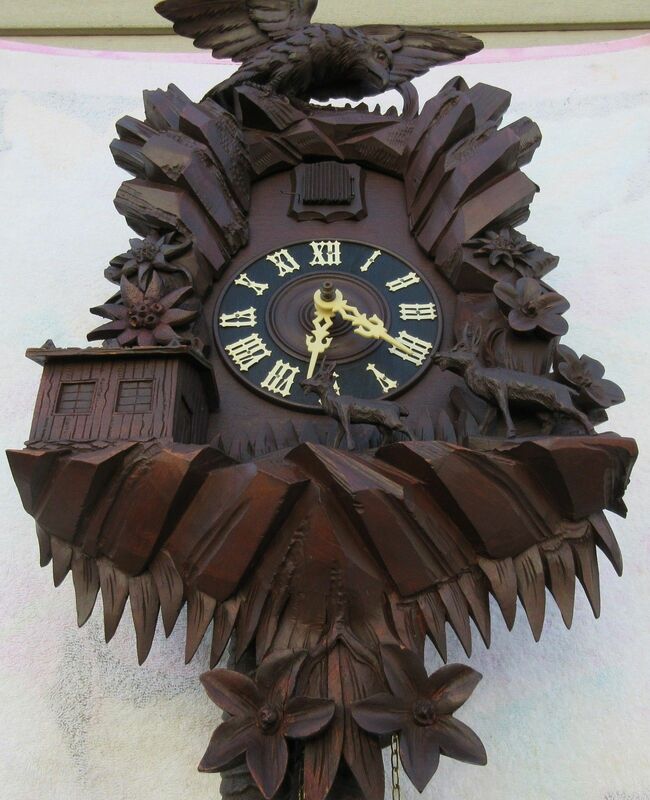 The clock is beautifully carved with many intricate cuckoo clock parts to make it pop. It is not badly made, this is not a cheap cuckoo clock. The main focus of this authentic German cuckoo clock is the beautiful eagle on the top. The eagle is carved with amazing detail. 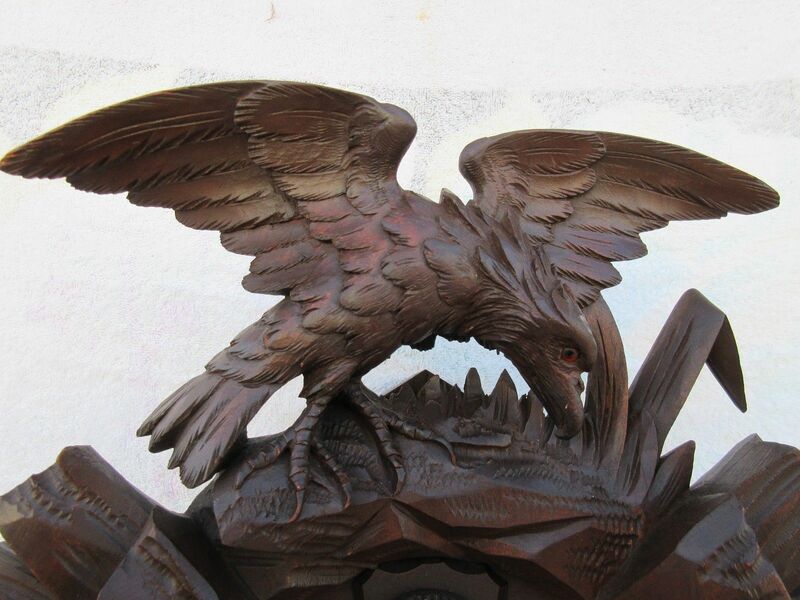 You can see every detail in the many hand carved feathers on the eagle. Along with the eagle is beautiful scenery with a cottage on the bottom left with two carved deer on the right. The sides are lined with beautiful daisy flowers that compliment the outdoor feeling of this affordable cuckoo clock. The eagle is landing on some rocky wood type mountainous carvings. 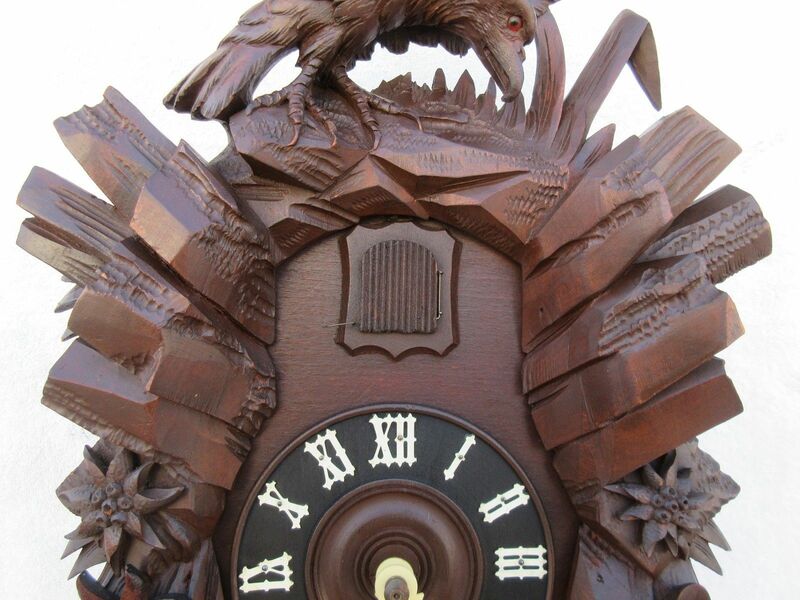 The mountainous carving follows the side of the clock all the way up to the eagle. 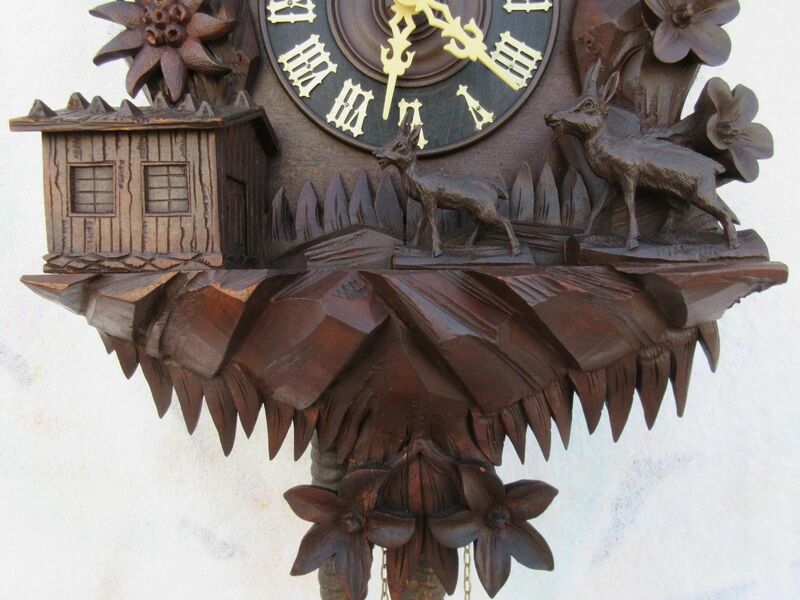 This traditional cuckoo clock has a historical story. 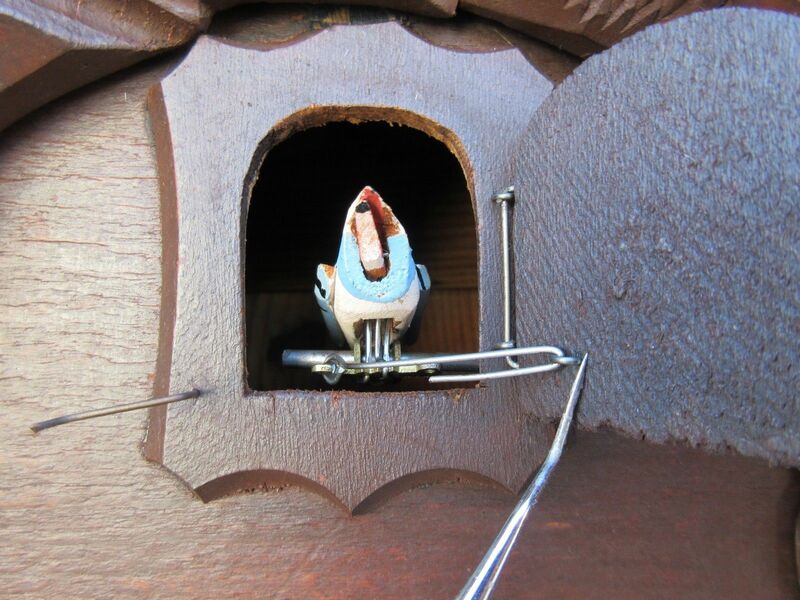 The best cuckoo clocks have a story! This clock originated around the time of World War II. This is a piece of history that originated in Germany while the world was at war. This piece of art survived the horror of war making it have a great story.